Learn how to develop the best foundation for CrossFit. Step 1 – THE BEGINNING. There is no question that having a great coach and gym with a good environment around you is the best way to start CrossFit. If you have all those things in place then you are already set and have no need to worry – stop reading this article and go sign up! However these conditions aren’t always available. Sometimes you live too far from the gym, you don´t have the cash to join or you may just not enjoy the coaching/class environment. If you fit into one of these categories please read on as you are not alone! When CrossFit started to explode it did so with thousands of athletes training in their garage gyms or at a park with minimal equipment. Some did extremely well in this environment, even making it onto the highest competitive stage – The CrossFit Games. So it is possible to train to a high level without an expensive gym around, however one thing is extremely crucial, you must develop the right foundations. When I first started CrossFit in 2007, the knowledge of gymnastic and weightlifting skills for the sport of CrossFit was so much lower than it is now (Just watch clips from the 2007 and 2008 Games and you will see what I mean…). However over the last 10 years we have refined our knowledge of the movements required and understood how to perform them correctly and safely. Meaning there is now no excuse not to develop the correct foundations for CrossFit. It is this refinement of knowledge that went into creating The Progrm. We all know by now that working out is good for us. It has a huge benefit to our health and we should all be doing it in some way shape or form. Therefore it is obvious you want to start training – so you can become healthier. Getting into CrossFit may seem a little intimidating as there are lots of new movements to get acquainted with, also the image often portrayed is of a jacked Games athlete lifting huge amounts of weight. The important aspect is that you start moving in the right way. This aspect of learning good technique and mobility from the start sets you up for a lifetime of moving well, with reduced injuries. Many athletes also come to CrossFit from different sports, some who have competed at a high level, this can be a blessing and a curse. These athletes may have developed a world class level of strength or conditioning and are therefore able compete with the best in specific tasks. 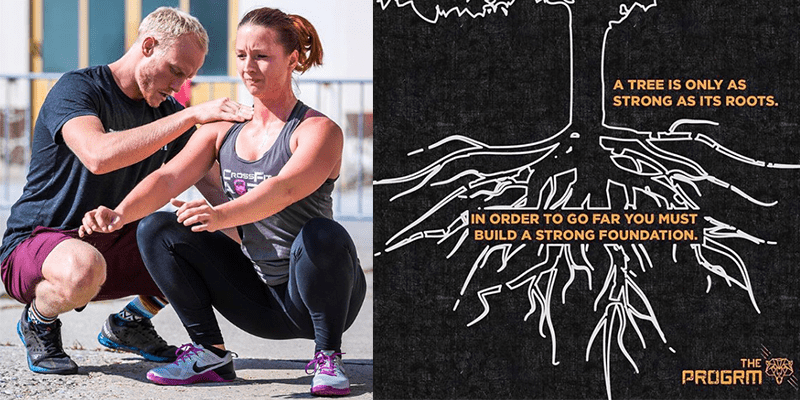 However the truth is that they haven´t developed the foundational skill set needed for CrossFit and combining these two factors can be a recipe for disaster. CrossFit is a hugely complex task and breaking down into manageable and achievable aspects is not actually an easy task. There are 10´s of movements you have to be capable of doing well, alongside developing your baseline strength and conditioning. This is one of the reasons we created The Progrm Foundation, to give you an easy template for starting your CrossFit journey. There will always be obstacles to doing something, however you have to prioritise your health now and one of the best ways to do this is to get started now. Sign-up before the 3rd of August and receive 80% off The Progrm Foundation forever! Meaning you will just pay 10€ per month compared to the normal 50€.